opened the season at UNH in Durham. she placed 15th at the New England Championships in Boston last winter. 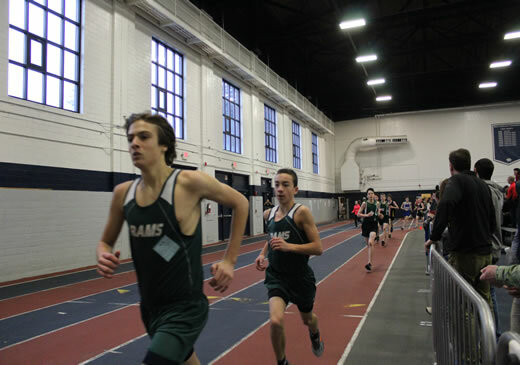 For the boys, freshman Joey Hutchinson debuted in the 600m with a time of 2:05.6 and junior Colton Corriveau also ran the 600m in a new personal best of 1:42.8. Junior Garrity Sargent placed 9th in the 1000m in a time of 3:12.5, followed by Gavin Call at 3:17.3. Freshman Kristjan Fraser debuted in the 1500m with a time of 5:20.0, behind junior Jacob Riley in 9th place at 5:06.9. During the holiday week on December 27th, Keri Lang again competed in the 300m, improving to 1:00.5, and Anna Harmon won the 600m by a margin of nearly 6 seconds with a time 1:46.1. For the boys, Garrity Sargent and Gavin Call improved their times in the 1000m to 3:11.8 and 3:13.7, respectively, and Kristjan Fraser improved in the 1500m with a time of 5:15.6.
and the entire team will compete again the next day at UNH.